Perhaps the best way to describe the experience of sitting through The LEGO Ninjago Movie is seeing a failed attempt to replicate something that was almost universally embraced. This is a reboot/reworking of the story told in the LEGO Ninjago animated TV series which, in turn, was a tie-in for the LEGO sets of the same name. For reasons known only to the screenwriters (six of whom have been credited), the animated portion of the movie is bookended by two short-action live sequences. There doesn’t seem to be any particular reason for these to exist unless it’s to give Jackie Chan some face-time or to introduce the cat who later plays a role in the main story. The LEGO Ninjago Movie is chock-full of action, most of which comprises various LEGO constructions being broken into their constituent pieces. It’s hard to say whether the repetitive nature of the Transformers-influenced battles represents a dip in quality from what we saw in the other LEGO movies or whether this method of animated storytelling is wearing thin. Sometimes, things that initially seem fresh and original lose those qualities as they are copied over time. That may be what’s happening here. Likewise, the self-referential, offbeat humor that helped make The LEGO Movie such a joy feels obligatory here. And attempts at character-building through the bizarrely sentimental father-son bonding sequences don’t work at all. In fact, they’re so close to parody that one is tempted to label them as such, except that the tone is all wrong. The movie’s hero is the Green Ninja who, when not wearing his disguise, goes by the name of Lloyd Garmadon (Dave Franco). While Green Ninja is the sworn enemy of the villainous Lord Garmadon (Justin Theroux), Lloyd happens to be the bad guy’s son. 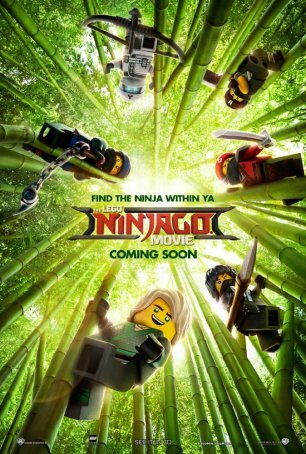 The city of Ninjago has other ninja protectors in a team assembled by Lord Garmadon’s brother, Master Wu (Jackie Chan). They include Kai (Michael Pena), the fire ninja; Jay (Kumail Nanjiani), the lightning ninja; Nya (Abbi Jacobson), the water ninja; Zane (Zach Woods), the robotic ice ninja; and Cole (Fred Armisen), the earth ninja. Every time Garmadon attacks, they rebuff him. However, when Lloyd uses the Ultimate Weapon against their foe, the results are disastrous and the ninja team is forced to embark on a quest to obtain the Ultimate Ultimate Weapon – their only hope to save Ninjago. No one ever expected a movie with the title of The LEGO Ninjago Movie to be Shakespeare but the storytelling is so straightforward and unsurprising that it threatens boredom. Aside from Jackie Chan, whose vocal stylings are distinctive, and Justin Theroux, who effectively captures Lord Garmandon’s pompous self-importance, the cast seems largely anonymous. This isn’t necessarily a bad thing. In fact, one can argue that animation works best when no one recognizes the voices, but it raises the question of why at least some of the actors from the TV series weren’t recruited. Fans might have enjoyed this nod to the past and it’s not as if using Dave Franco and Fred Armisen is going to cause a stampede at the box office. For the most part, the animation doesn’t appear up to par with what The LEGO Movie offered. The overall style is the same but a lot of short-cuts were taken and the visuals don’t “pop” as effectively. It’s hard to say whether this was a budgetary issue or whether the project was rushed through production. Whatever the case, the film’s look is another indication of the step-down in quality. Presumably, The LEGO Ninjago Movie will find favor with those who are familiar with the franchise in any of its earlier formats. It should also entertain children, many of whom will begin immediately lobbying their parents to visit the toy store. Adults, however – especially those who enjoyed The LEGO Movie and/or The LEGO Batman Movie – are in for a disappointment. A 90-second toy commercial is generally innocuous but stretch it out to 90 minutes and it can be a challenge to endure.